The butterfly Queen with her monarch wings and monarch-inspired black velvet gown, strolls through the garden with a young monarch caterpillar. Media: Head, hands and feet of Super Sculpey, on a wire armature, with a cloth body. She has white mohair pulled back into a bun. She wears a peach satin underskirt with lace and beaded fabric flower petal trim. Her dress is black velvet beaded with small white flowers to simulate the pattern on the edges of monarch butterfly wings. Her stand-up collar is made of white and coloured fabric flower petals. Her wings are sewn from white cotton, and then painted with acrylics. 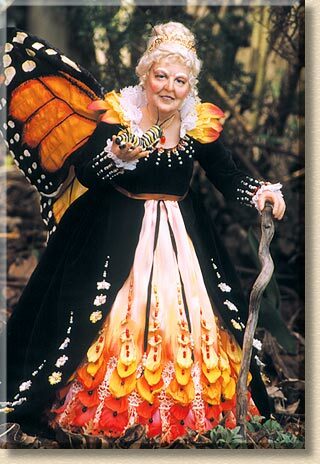 Props: She has a walking stick in her left hand, and supports a monarch caterpillar on her right hand. The caterpillar is sculpted from coloured Sculpey III.